I can empathize with the Occupy Wall Street protestors, but my perception is that many of them misunderstand the cause of their pain. They naively blame capitalism; they should blame corporatism. Corporatism is pro-business. Specific businesses get government subsidies, above-market-rate contracts, or special recognition. Capitalism is pro-market. The consumer decides whether to favor GM or Ford; Cafe Rio, Costa Vida, Bajio, or Chipotle. 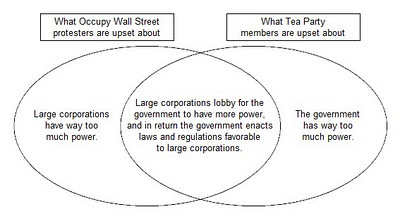 I loved Phil Windley’s post today on how Occupy Wall Street and the Tea Party, though they seem like polar opposites, actually share a disdain of corporatism and ought to work together to fight it. I believe that you are mistaken. The reason why we have Occupy Wall Street, various labour movements in Scandinavian countries, the Tea Party and the Arab Spring is because of the vast inequality, instability and devastation produced by capitalism. Capitalism is in fact an inherently unstable economic system based on the endless production of goods and services irrespective of human needs. It is because of capitalism that roughly 22,000 children die each and every day from malnutrition, it is because of capitalism that roughly 450 billionaires have more combined wealth than that of over half the world’s population combined. We are stuck in the tragedy of the commons……when you speak of corporatism, you are simply highlighting a natural progression or stepping stone of capitalism. It is only natural that a society built around greed and exploitation will attempt to mold itself in connection with governments…..just look at the excessive ear marks and funding that are directed towards politicians in the USA….this doesn’t occur anywhere else in the world (to this extent) To this day, over half the world’s population lives on less than $2 a day……you must really look beyond your own relationship with capitalism to understand the bigger picture….there is an alternative though and I encourage you to watch the film : Zeitgeist: Addendum…have a nice day. Hi Justin. Your sentiment of concern for the poor is good and correct. I don’t see evidence that the cause for concern is capitalism. You’ve mentioned a few unfortunate statistics without explaining why capitalism is to blame. Compare an index like the Heritage Foundation’s Freedom Index (a “measurement” of economic freedom in a country) and malnutrition by country — they’re almost opposites. The economically freest countries are among the countries with the least malnutrition. In a capitalistic society, you can’t become rich without producing something that someone wants. In such a society, billionaires aren’t undesirable; they’re actually producing things that people want. The “pie” grows larger and standards of living increase, including for the poor. In a society that allows corporatism, one can get rich by getting a government contract or favor from government — something individuals may not have wanted in the absence of government. I don’t support this method of becoming a billionaire. That’s no longer capitalism. If you’re saying that capitalism doesn’t produce unselfishness or love or kindness, you’re correct. But no political system does. Capitalism, remarkably, lifts the poor even when people are acting in a self-interested way. (People in every economic system act in a self-interested way.) For teaching love, unselfishness, and kindness there are other institutions.